Participants in the Festival "Beethoven,"
Ellsworth Peterson, Artistic Director, is professor emeritus of music at Southwestern University. He holds an undergraduate degree from Southwestern University, a Master of Sacred Music degree from Union Theological Seminary, and a PhD from Harvard. He has been Artistic Director for all of the previous Festivals of the Arts. Festival composers have been Handel (2005); Haydn (2006); Schubert (2007); Mendelssohn (2008); Dvořák (2009); Copland (2010); Brahms (2011); Debussy, Ravel and Poulenc (2012); Tchaikovsky, Arensky and Rachmaninov (2013); and Albéniz, Granados, and Falla (2014); Robert and Clara Schumann (2015), Grieg, Sibelius and Nielsen (2016), Elgar, Vaughan Williams and Britten (2017) and Chávez, Villa-Lobos and Ginastera (2018). 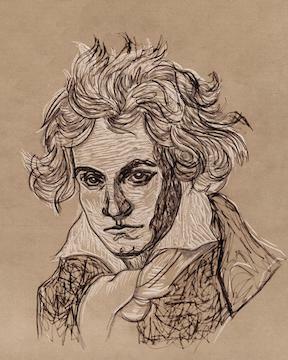 Jan Swafford is the author of the 2014 Beethoven: Anguish and Triumph. He has also written biographies of Johannes Brahms and Charles Ives, as well as the introductory Vintage Guide to Classical Music. He earned his BA from Harvard College and his MMA and DMA from the Yale School of Music. His compositions have won a number of awards, including an NEA Composer Grant, two Massachusetts Artists Foundation Fellowships and a Tanglewood Fellowship. His writing and commentary on music has been featured on NPR and in Slate, the Guardian, Grammophone, and elsewhere. Swafford teaches music history, theory and composition at the Boston Conservatory. Susan Youens is recognized as a distinguished scholar of the German Lied. Her publications include Schubert’s Late Lieder: Beyond the Song Cycles; Schubert’s Poets and the Making of Lieder; and Hugo Wolf: The Vocal Music. She holds an undergraduate degree from Southwestern University and MA and PhD from Harvard. She is currently on the faculty of the Department of Music of Notre Dame University. Lynn Parr Mock, soprano, holds a BME degree from Southwestern University, where she studied with Virginia Dupuy, and MM degree from the University of Texas at Austin. She balances performing commitments with service on the boards of many fine arts organizations and is a co-founder of Lone Spring Arts in Dallas. Shields-Collins Bray, piano, has been principal keyboardist of the Fort Worth Symphony Orchestra since 1986, and has hosted its Symphonic Insights discussions since 1993. He has appeared many times as soloist with the orchestra, most recently in the Bolivian composer Agustin Fernandez's Una Musica Escondida. Mr. Bray is artistic advisor at the Van Cliburn Foundation, where his duties include the creation and performance of all programs in Musical Awakenings, the Cliburn's vast educational initiative. Mr. Bray also is the artistic director of Cliburn at the Modern, a series in which he hosts the most distinguished composers of our time. Born in Louisiana, Mr. Bray studied piano with Steven De Groote at Arizona State University and at TCU. Hai Zheng, cello, is Artist in Residence at Southwestern University. She has appeared in recital at the Shanghai Conservatory and New York City’s Steinway Hall, in master classes and recitals at Gungzhou and Macau Conservatories, and at a special invitation concert for the Hong Kong Asia Society, among many others. Kiyoshi Tamagawa, piano, is Professor of Music and Associate Dean for the Sarofim School of Fine Arts at Southwestern University. He has performed as a soloist and collaborative pianist throughout North America, as well as in Europe and Asia. His latest orchestra appearances have been with the Austin Symphony Orchestra in performances of the Piano Concerto in C major, K. 503 by Mozart, with the Oahu Civic Orchestra, Honolulu, Hawaii and in May 2016 with the Temple Symphony in a performance of Mozart’s Concerto in E-flat major, K. 482. In 2015 he also completed a tour of Asia and a CD recording with Southwestern University faculty cellist Hai Zheng. Virginia Dupuy, mezzo-soprano, is an alumna of Southwestern University and Professor of Music at Southern Methodist University. Her career in vocal performance and recording includes a Grammy nomination for her CD Voces Americanas with the Voices of Change ensemble. An Emily Dickinson scholar, she has recorded Dwell in Possibility: Emily Dickinson in Song. She has appeared with orchestras and opera companies across the US, and has been a performer in and supporter of the Festival of the Arts since its beginning. Alessandra Comini is University Distinguished Professor of Art History Emerita at Southern Methodist University. She received her BA degree from Barnard College, her MA from the University of California at Berkeley, and her PhD “with distinction” from Columbia University where she taught for ten years. In 1996 she was named Distinguished Visiting Lecturer at Oxford University’s European Humanities Research Centre. For the 250th anniversary of Beethoven’s birth, the Viennese publisher Hollitzer is publishing a German translation of her book The Changing Image of Beethoven with a new chapter concerning Beethoven in the 21st century. Bruce Cain, baritone, is Associate Professor of Music and director of the Opera Theatre at Southwestern University. He holds a BMus degree from McMurry University, MMus from Indiana University, and DMus from Northwestern University. He has performed concerts on five continents. He is conductor of the San Gabriel Chorale. David Utterback is an active collaborative and solo pianist in the Austin area. Performing most often as a vocal accompanist, he is involved in a wide variety of musical endeavors including chamber music, opera, cabaret, and musical theater. He is a member of the Austin Chamber Ensemble, and also is the accompanist for the choirs of Chorus Austin (Austin Civic Chorus and Austin Vocal Arts Ensemble). He has held his current appointment as a member of the piano faculty at Southwestern University since 1993. Elizabeth Pitcairn, a highly-regarded concert violinist, made her New York debut at Lincoln Center’s Alice Tully Hall in 2000 with the New York String Orchestra. She has also appeared as soloist with the Philadelphia Orchestra and the Marlboro Music Festival where she performed with members of the Juilliard and Guarneri String Quartets. Ms. Pitcairn performs in partnership with the “Red Mendelssohn” Violin (Stradivarius 1720). It was purchased as a gift from her grandfather in 1990 at auction at Christie’s London. It is this auction which is said to have inspired the movie The Red Violin, which won the Academy Award for musical score in 1999. She is the President and Artistic Director of the Luzerne Music Center and Chamber Music Festival in Lake Luzerne, New York. Toby Blumenthal, piano, has been a soloist with ensembles including the Chicago and Houston Symphony Orchestras. She has studied with Leonard Shure at the University of Texas and with Rudolf Serkin at the Marlboro Chamber Music Institute in Vermont. She is Director of CHAMPS (Chamber Music in Public Schools), Director of Salon Concerts of Austin, and is Artistic Director and pianist for Classic Chamber Concerts. She played in the San Antonio Mozart Festival with the Artisan String Quartet in 2016 and 2017 and in the Texas Bach Festival of Georgetown in 2018. She has played in many of the past Festivals of the Arts. The Round Rock Symphony is now in its ninth season as the only professional orchestra in Williamson County and has been under the leadership of Music Director Stefan Sanders since 2012. Its goal is to make the RRS a part of the cultural fabric of central Texas, expanding audiences through creative programming, appearances in a range of different venues, and increased educational offerings. Stefan Sanders, conductor, is Music Director and Conductor of the Round Rock Symphony. He also holds the Montante Family Endowed Associate Conductor Chair with the Buffalo Philharmonic Orchestra. He holds a bachelor’s degree from the Juilliard School and Master and Doctor of Musical Arts degrees from the University of Texas at Austin. Prior to a career as a conductor, Mr. Sanders was an internationally known trombonist, performing as a soloist in the United States, Asia and Europe. Lana Neal has a PhD in Musicology from the University of Texas at Austin. She has an M.M. in Musicology from the University of Texas at Austin and a B.A. in Mathematics and Music from Southwestern University. Her research encompasses topics in music archaeology, medieval music, and structural principles in the music of Bela Bartok. She has taught music at the University of Texas at Austin, USA and Franklin College in Switzerland. She is the author of The Earliest Instrument: Ritual Power and Fertility Magic of the Flute in Upper Paleolithic culture. Kirsten Peterson is an adjunct instructor of music at the University of Connecticut-Stamford and Naugatuck Valley Community College. She received her doctorate in Music History and Theory from the University of Connecticut. Her research interests include nationalism and folk music influence in 19th- and 20th-century music She has given presentations at three earlier Georgetown Festivals of the Arts, discussing folk and nationalistic influences on the music of Dvořák, Brahms and Vaughan Williams. She is principal bassoonist with the Waterbury Symphony Orchestra in Connecticut. William E. Nicholas is a retired professor of American and Latin American history. He taught for forty years at Birmingham-Southern College in Birmingham, Alabama. His avocations include Spanish study, piano, and travel. He lives in Georgetown. Steven Brennfleck, tenor, has been consistently acknowledged for his consummate artistry, vocal flexibility, and moving interpretations on the operatic and concert stage. He has collaborated with the Alabama Symphony Orchestra, American Bach Soloists, Handel Choir of Baltimore, Philadelphia Youth Orchestra, Princeton Baroque Orchestra, LA International New Music Festival, June in Buffalo Festival, Temple Symphony Orchestra, Westminster Festival Orchestra, and Princeton Pro Musica in works such as Bach’s Mass in B Minor, Magnificat, and St. John Passion, Britten’s Cantata Misericordium, Haydn’s Creation and Missa St. Nicholas, Mozart’s "Coronation" Mass, Mass in C minor, Requiem, and Vesperae Solennes del Confessore, and Saint-Saën’s Christmas Oratorio. The Thalea String Quartet, formed in 2014 at the Zephyr International Chamber Music Festival in Courmayeur, Italy, has performed in recitals in Italy, France, the United States and Canada; it was appointed the first quartet-in-residence at the San Francisco Conservatory of Music from 2015-17. The quartet made its debut at the Kennedy Center in Washington, DC in early 2016. In 2018 they were chosen to be the Young Professional String Quartet-in-Residence at the Butler School of Music at the University of Texas at Austin. Jessica Mathaes, violin, enjoys a multifaceted career as a soloist, recording artist, educator and concertmaster. She has appeared as a soloist throughout the United States and internationally in Europe and Asia, and has been broadcast live on Performance Today, Chicago Public Radio, and ARTE, the French-German cultural television channel. She has been featured with numerous orchestras throughout the United States. She is concertmaster of the Austin Symphony Orchestra. San Gabriel Chorale was founded in 1988 at Southwestern University by Dr. Kenny Sheppard as a “town and gown” outreach to offer people a chance to sing works from the rich a cappella and oratorio choral traditions that date from the 16th century up to the present. It contains about 75 singers, all volunteers who pay annual dues and buy their own copies of the music. They are mostly from Georgetown, including many from Sun City, but some live anywhere from North Austin to Killeen and Temple. Dr. Bruce Cain of Southwestern has been conductor of the Chorale since 1998. Kenny Sheppard, conductor, is a professor emeritus in the Department of Music at Southwestern University and retired conductor of the University Chorale. Since 1988 he has trained active choral conductors through the Conductor’s Institute, providing instruction and experience in conducting a chorus with orchestra. He has led the Festival Chorus and Orchestra for all of the Georgetown Festivals of the Arts. is professor emeritus of music at Southwestern University. He holds an undergraduate degree from Southwestern University, a Master of Sacred Music degree from Union Theological Seminary, and a PhD from Harvard. He has been Artistic Director for all of the thirteen previous Festivals of the Arts. Festival composers have been Handel (2005); Haydn (2006); Schubert (2007); Mendelssohn (2008); Dvořák (2009); Copland (2010); Brahms (2011); Debussy, Ravel and Poulenc (2012); Tchaikovsky, Arensky and Rachmaninov (2013); and Albéniz, Granados, and Falla (2014); Robert and Clara Schumann (2015), Grieg, Sibelius and Nielsen (2016) and Elgar, Vaughan Williams and Britten (2017). is a retired professor of American and Latin American history. He taught for forty years at Birmingham-Southern College in Birmingham, Alabama. His avocations include Spanish study, piano, and travel. He lives in Georgetown. is Professor of Music and Associate Dean for the Sarofim School of Fine Arts at Southwestern University. He has performed as a soloist and collaborative pianist throughout North America, as well as in Europe and Asia. His latest orchestra appearances have been with the Austin Symphony Orchestra in performances of the Piano Concerto in C major, K. 503 by Mozart, with the Oahu Civic Orchestra, Honolulu, Hawaii and in May 2016 with the Temple Symphony in a performance of Mozart’s Concerto in E-flat major, K. 482. In 2015 he also completed a tour of Asia and a CD recording with Southwestern University faculty cellist Hai Zheng. is an alumna of Southwestern University and professor of music at Southern Methodist University. Her career in vocal performance and recording includes a Grammy nomination for her CD Voces Americanas with the Voices of Change ensemble. An Emily Dickinson scholar, she has recorded Dwell in Possibility: Emily Dickinson in Song. She has appeared with orchestras and opera companies across the US, and has been a performer in and supporter of the Festival of the Arts since its beginning. is Artist in Residence at Southwestern University. She has appeared in recital at the Shanghai Conservatory and New York City’s Steinway Hall, in master classes and recitals at Gungzhou and Macau Conservatories, and at a special invitation concert for the Hong Kong Asia Society, among many others. holds a BME degree from Southwestern University, where she studied with Virginia Dupuy, and MM degree from the University of Texas at Austin. She balances performing commitments with service on the boards of many fine arts organizations and is a co-founder of Lone Spring Arts in Dallas. Interlochen, and Fellowship String Quartet at Wintergreen Performing Arts. Austin Bella Corda guitar ensemble is comprised of outstanding pre-college guitarists, all who emerged from the Childbloom® Guitar Programs of Central Texas. The Austin Bella Corda guitar ensemble 2017/18 members are Olivia Bannister, Aytahn Benavi, Elyce Garcia, Kabeer Motwani, Noah Kentros, Simon Krauskopf, Linden Meyer, Elle Smith. Director of Austin Bella Corda Guitar Ensemble. is now in its ninth season as the only professional orchestra in Williamson County and has been under the leadership of Music Director Stefan Sanders since 2012. Its goal is to make the RRS a part of the cultural fabric of central Texas, expanding audiences through creative programming, appearances in a range of different venues, and increased educational offerings. is Music Director and Conductor of the Round Rock Symphony. He also holds the Montante Family Endowed Associate Conductor Chair with the Buffalo Philharmonic Orchestra. He holds a bachelor’s degree from the Juilliard School and Master and Doctor of Musical Arts degrees from the University of Texas at Austin. Prior to a career as a conductor, Mr. Sanders was an internationally know trombonist, performing as a soloist in the United States, Asia and Europe. has toured extensively through the United States, Europe and South America, gaining recognition as a soloist, chamber musician, and teacher. As soloist he has performed with orchestras in the United States, Spain, and France. Fabián is currently the first violinist of the Carlos Chavez String Quartet. In North Carolina he has appeared as concertmaster of the Greensboro and Ashville Symphonies. is Associate Professor of Music and director of the Opera Theatre at Southwestern University. He holds a BMus degree from McMurry University, MMus from Indiana University, and DMus from Northwestern University. He has performed concerts on five continents. He is conductor of the San Gabriel Chorale. is an active performer, teacher, scholar and adjudicator who has appeared on concert stages in Europe, Canada, Central America and throughout the United States. He has been the recipient of numerous awards including the Diploma of Merit from the Academia Chigiana in Siena, Italy. He has served on the faculty of Southwestern University since 1992. His studies with renowned pedagogue Aaron Shearer led to a Bachelor of Music degree from the North Carolina School of the Arts. He received his Master and Doctor of Musical Arts degrees from the University of Texas at Austin where he worked under the direction of Adam Holzman. performs, records and tours with the flute and harp ensemble Chaski. She also plays principal flute with the Round Rock Symphony, Panoramic Voices and Chorus Austin. She teaches flute and coaches the Flute Ensemble and Andean Ensemble at Southwestern University. is an active collaborative and solo pianist in the Austin area. Performing most often as a vocal accompanist, he is involved in a wide variety of musical endeavors including chamber music, opera, cabaret, and musical theater. He is a member of the Austin Chamber Ensemble, and also is the accompanist for the choirs of Chorus Austin (Austin Civic Chorus and Austin Vocal Arts Ensemble). He has held his current appointment as a member of the piano faculty at Southwestern University since 1993.
is an adjunct instructor of music at the University of Connecticut-Stamford and Naugatuck Valley Community College. She received her doctorate in Music History and Theory from the University of Connecticut. Her research interests include nationalism and folk music influence in 19th- and 20th-century music She has given presentations at three earlier Georgetown Festivals of the Arts, discussing folk and nationalistic influences on the music of Dvořák, Brahms and Vaughan Williams. She is principal bassoonist with the Waterbury Symphony Orchestra in Connecticut.